Cystoscopy: What is it and how it is performed? 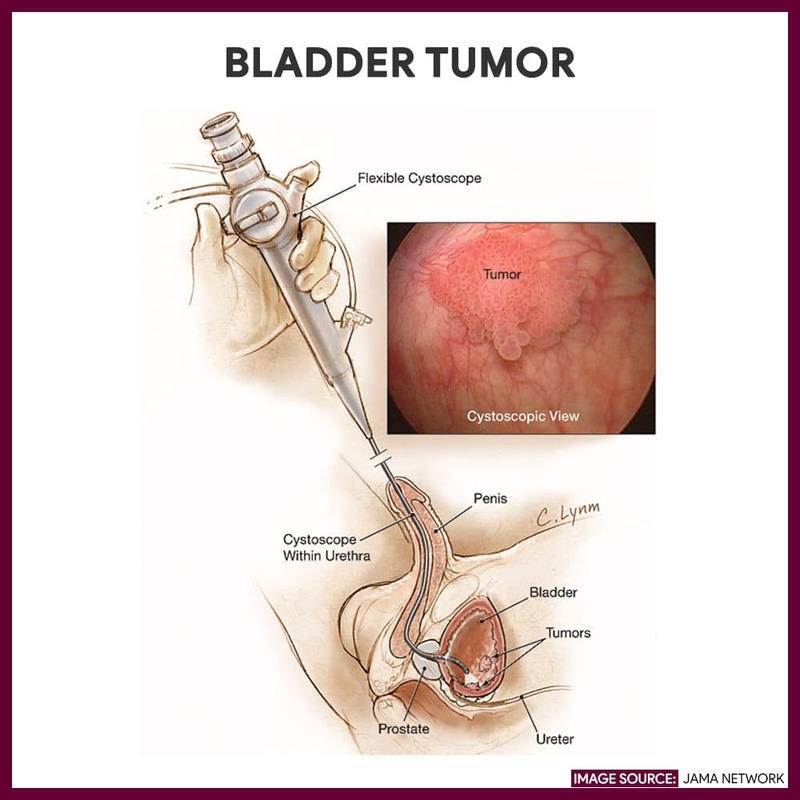 Cystoscopy, also known as cystoureterography or prostatography, is an invasive diagnostic procedure that allows direct visualization of the urethra, urinary bladder, and ureteral orifices through the transurethral insertion of a cystoscope into the bladder. 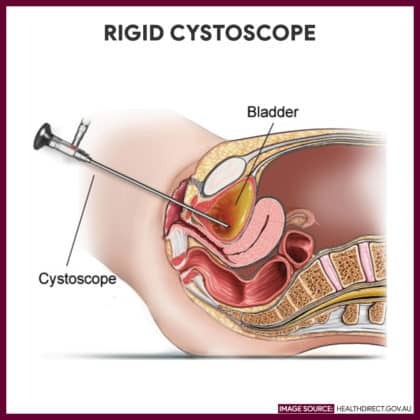 There are two types of cystoscopy: rigid and flexible. 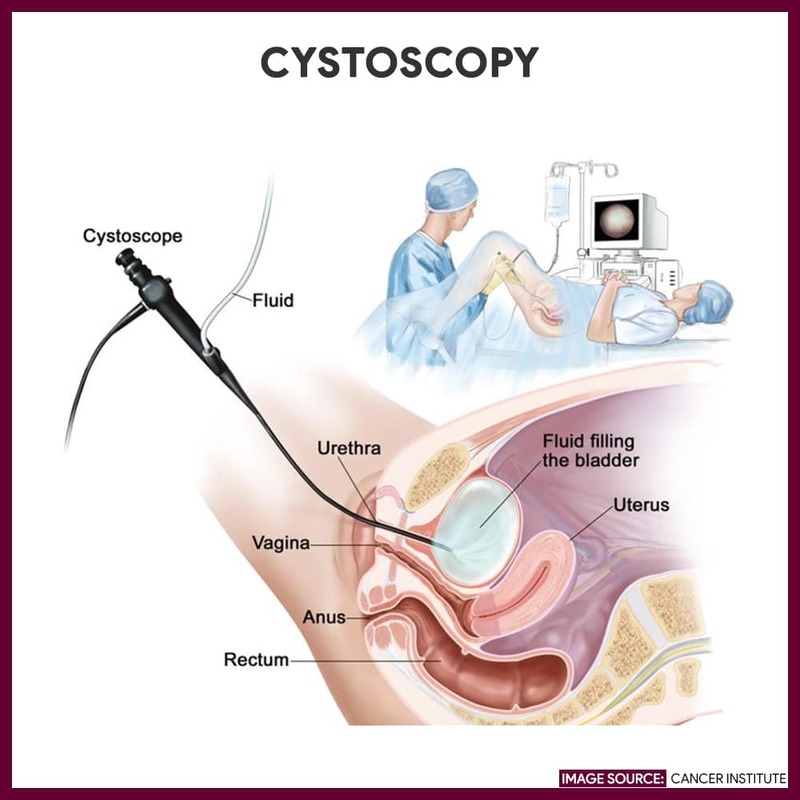 A rigid cystoscopy uses a thin, lighted tube that consists of an obturator and a telescope with a lens and light system; It is usually performed to take tissue samples and carry out complicated surgeries. It is done under general or spinal anesthesia. While flexible cystoscopy uses a flexible fiber-optic telescope to provide diagnosis of urinary abnormalities and to evaluate the effectiveness of a treatment. It is performed under local anesthesia. The nurse needs to help prepare the patient during cystoscopy. 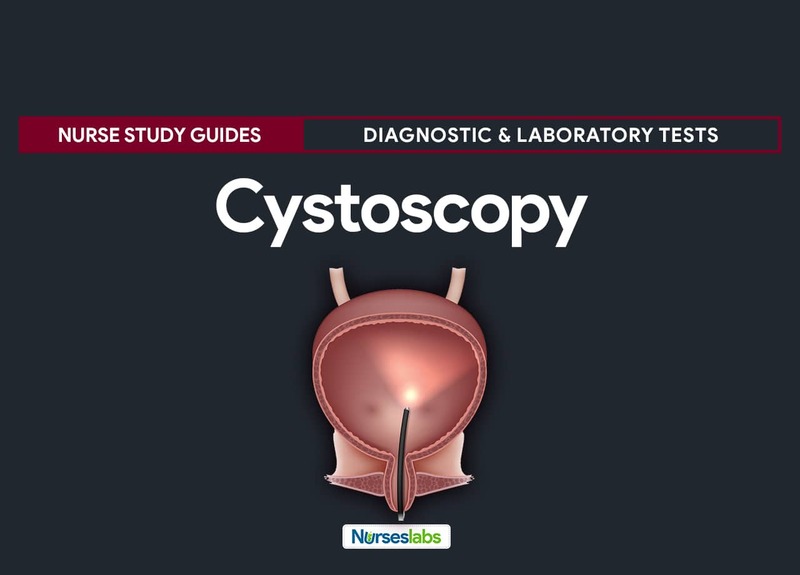 This study guide lists the tasks and responsibilities of the nurse during cystoscopy. The patient is asked to empty his or her bladder before the procedure and to change into a surgical gown. Place patient in a lithotomy position. The patient is placed in the lithotomy position, the buttocks should be positioned at the edge of the table and the feet are placed in stirrups. The genitalia is cleaned with an antiseptic solution, and the patient is draped. Sedative or local anesthesia is given. A local anesthetic is instilled into the urethra if general anesthesia will not be used. 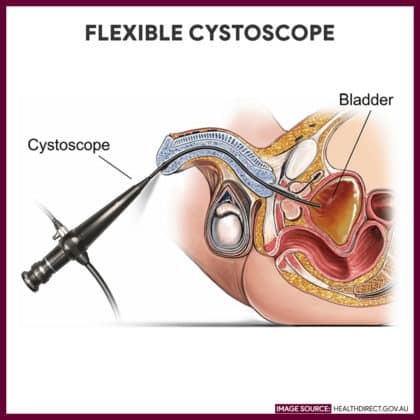 The cystoscope or a urethroscope is inserted to examine the urethra before cystoscopy. The urethroscope has a sheat that may be left in place, and the cystoscope is inserted through it, avoiding multiple instrumentations. After insertion of the cystoscope, a sample of residual urine may be taken for culture or other analysis. Bladder is filled with irrigating solution. The bladder is irrigated through an irrigation system attached to the scope. The irrigation fluid helps in bladder visualization. 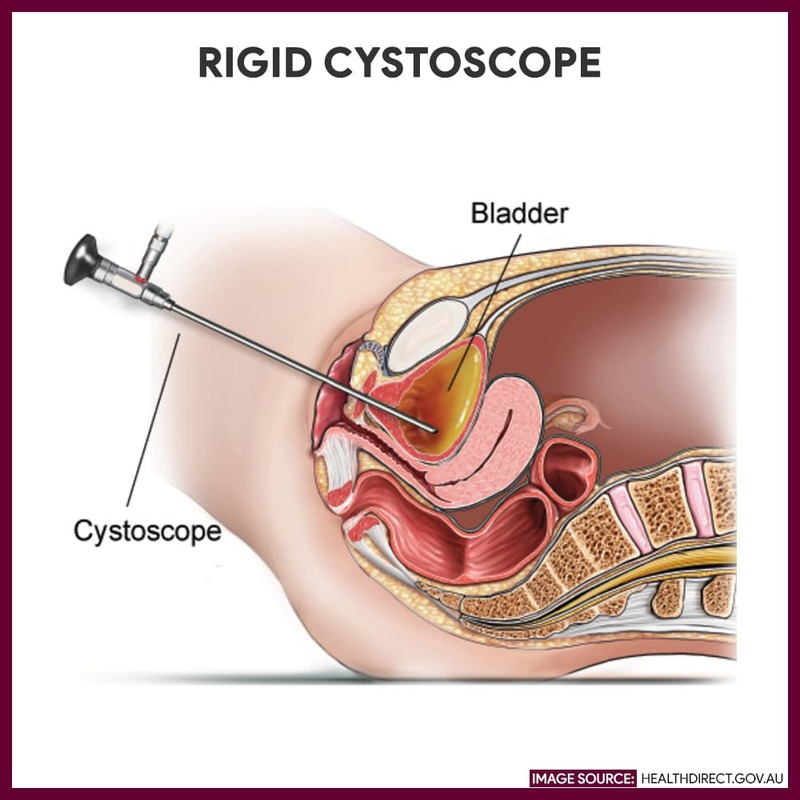 -If a prostatic tumor is found, a biopsy specimen may be obtained by means of a cytology brush or biopsy forceps inserted through the scope. If the tumor is small and localized, it can be excised and fulgurated. 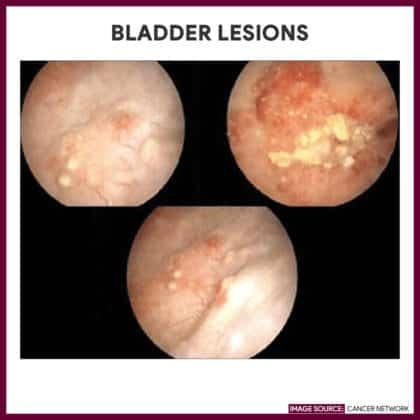 This procedure is termed transurethral resection of the bladder. -Polyps can also be identified and excised. -Ulcers or bleeding sites can be fulgurated using electrocautery. -Renal calculi can be crushed and removed from the ureters and bladder. -Ureteral catheters can be inserted via the scope to obtain urine samples from each kidney for comparative analysis and radiographic studies. -Ureteral and urethral strictures can also be dilated during this procedure. 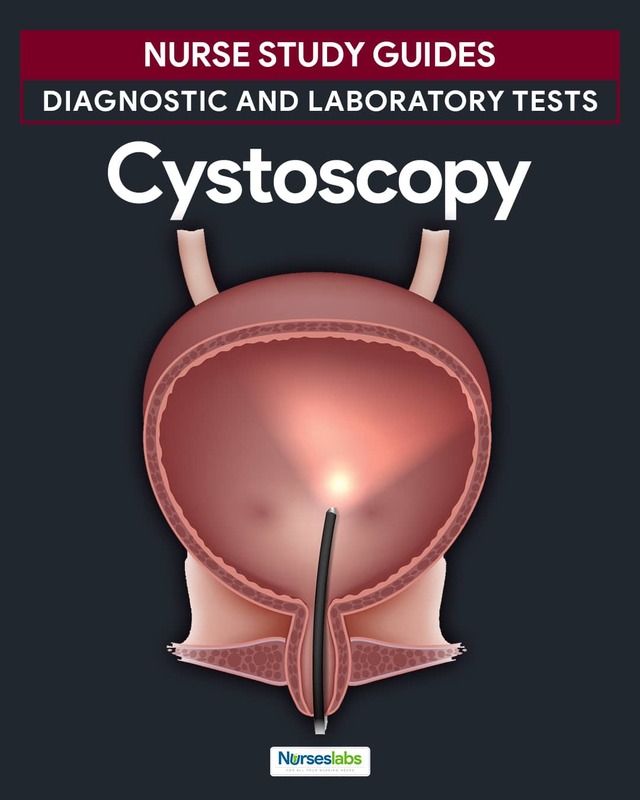 Upon completion of the examination and related procedures, the cystoscope is withdrawn. Specimen is sent to the laboratory. Place obtained specimens in proper containers, label them properly, and immediately transport them to the laboratory. Assess patient’s understanding of the procedure and answer any queries. The procedure is usually performed in a urology clinic and it takes about 30-45 minutes. Inform the patient who will perform the test, where it will take place, and other health team members involved in the care. Obtain informed consent. A written and informed consent is signed prior to the procedure and before administration of medications. Withhold blood thinning medications. Some examples are aspirin, warfarin (Coumadin), enoxaparin (Lovenox), heparin, clopidogrel (Plavix), and dabigatran (Pradaxa). Provide instruction for fasting and non-fasting preparation. Unless a general anesthetic has been ordered, inform the patient that he doesn’t need to restrict food and fluids. If a general anesthetic will be administered, instruct the patient to fast for at least 6 to 8 hours prior to the test. Establish an IV line. To allow infusion of fluids, anesthetics, sedatives or emergency medications. Prepare the patient. Instruct patient to empty the bladder prior to the procedure and to change into the hospital gown provided. Administer sedation and other medications as ordered. Preoperative medications are given 1 hour before the test. Sedative decreases the spasm of the bladder sphincter, reducing the patient’s discomfort. Monitor and record vital signs. An increase in pulse (tachycardia) and a decrease in blood pressure (hypotension) may indicate a sign of hemorrhage. Assess the patient’s ability to void at least 24 hours after the procedure. Urinary retention may be secondary to edema as a result from instrumentation. Observe the color of urine. Pink-tnged urine and burning or mild discomfort when urinating may be experienced for a few voidings after the procedure. This usually resolves within two or three days. Encourage increased fluid intake as indicated. Fluids will help flush the bladder to decrease the amount of bleeding and to reduce risk of infection. Encourage deep breathing exercises. These exercises may relieve the patient from bladder spasms. Provide warm sitz baths and administer mild analgesics as ordered. These may relieve urinary discomfort and promote muscle relaxation. Watch out for signs of serious complications (sepsis, bladder perforation, hematuria). Persistent, severe flank pain, elevated temperature over 101° F, chills, bright red blood or clots in the urine, painful urination, or urinary retention must be reported immediately to the HCP. Normal size, shape, and position of the urethra, bladder, and urethral structure. 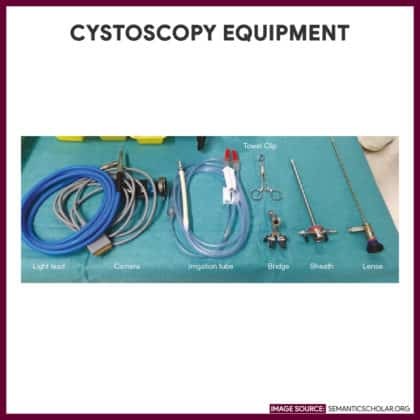 Equipment needed during a cystoscopy. 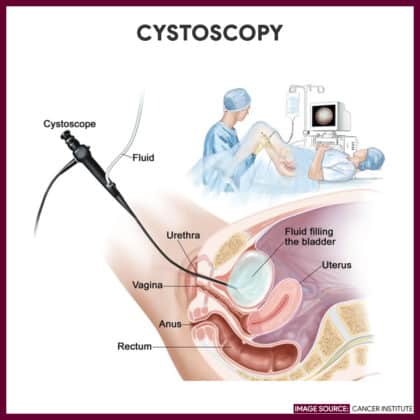 Note the use of a rigid cystoscope. Rigid cystoscope uses a thin, lighted tube that consists of an obturator and a telescope with a lens and light system; It is usually performed to take tissue samples and carry out complicated surgeries. Flexible cystoscopy uses a flexible fiber-optic telescope to provide diagnosis of urinary abnormalities and to evaluate the effectiveness of a treatment. Cystoscopy result showing ulcerative and nodular lesions on the bladder mucosa, related to gross hematuria. 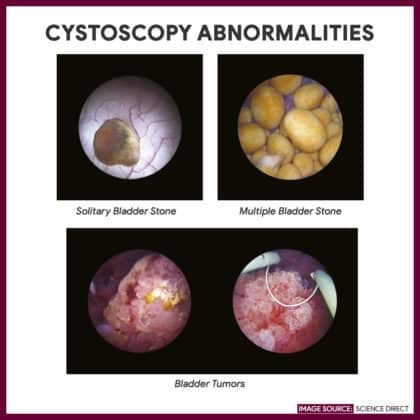 Common abnormalities found in cystoscopy: bladder stones and bladder tumors. Several views of a tight urethral stricture, or narrowing due to scar tissue in the urine tube. This stricture is located in what is termed the bulbar urethra. This is a fairly common stricture location. The scar tissue causing the urethral narrowing is about one inch down stream from the prostate. The urethra should be open as wide as the surgical view. Instead, the opening is only about as wide as a pencil lead. Strictures such as this usually require an open surgical procedure to have the best chance of permanent repair. Fenlon, H. M., Bell, T. V., Ahari, H. K., & Hussain, S. (1997). Virtual cystoscopy: early clinical experience. Radiology, 205(1), 272-275. Song, J. H., Francis, I. R., Platt, J. F., Cohan, R. H., Mohsin, J., Kielb, S. J., … & Montie, J. E. (2001). 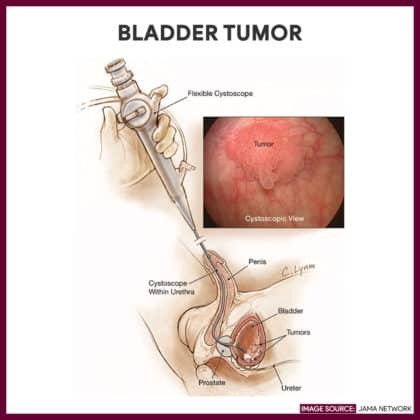 Bladder tumor detection at virtual cystoscopy. Radiology, 218(1), 95-100. Vining, D. J., Zagoria, R. J., Liu, K., & Stelts, D. (1996). CT cystoscopy: an innovation in bladder imaging. AJR. American journal of roentgenology, 166(2), 409-410. Paul Martin is a registered nurse with a bachelor of science in nursing since 2007. Having worked as a medical-surgical nurse for five years, he handled different kinds of patients and learned how to provide individualized care to them. Now, his experiences working in the hospital is carried over to his writings to help aspiring students achieve their goals. He is currently working as a nursing instructor and have a particular interest in nursing management, emergency care, critical care, infection control, and public health. As a writer at Nurseslabs, his goal is to impart his clinical knowledge and skills to students and nurses helping them become the best version of themselves and ultimately make an impact in uplifting the nursing profession.